Growing up, I'm pretty sure I denied myself a childhood. I was a big fan of the sleepover, and who wasn't? Getting to stay up late with your best friends, eating junkfood, watching movies; what could be better? I was something of a wet blanket at these from time to time because my well-documented aversion to scary movies constantly left me vetoing films of the type. Basically what I'm saying is I never got to see Scream. Scream's schtick is a well-known pop culture hallmark at this point. Hell, it even spawned a series of popular parody films that went crazy off the rails and are now directly responsible for the rise of the Friedberg/Seltzer shame factory. Someone's killing photogenic teens in the small town of Woodsboro, CA and tormenting their victims with slasher movie trivia. Could it be the no-good boyfriend? The horror movie nerd? The dad who has conveniently left town the day before? Everyone's a suspect (except Neve Campbell, of course) and basic working knowledge of how horror movies work might be the only way to stay alive. This one was directed by Wes Craven and is extremely self-conscious about it. The characters all openly talk about horror movie cliches and how it they're in a horror movie as the ghostfaced killer picks them off one by one. 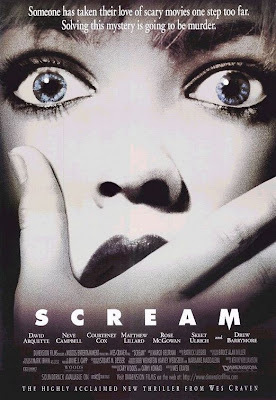 Scream is something of a generational touchstone I suppose because it made its teenage audience of the time worry not that they were just being tormented by masked psycho-killer but that they were being tormented by a masked psycho-killer from one of those movies they like watching. Funny Games it ain't, but it's certainly a fun commentary on the way film affects us, even though it purposefully follows the tropes it seemingly upends. But was it scary? I'm sure if I was a teenager, this might have scared me, but I was having too much damn fun. And at times I think it's honestly too silly to really be frightening.